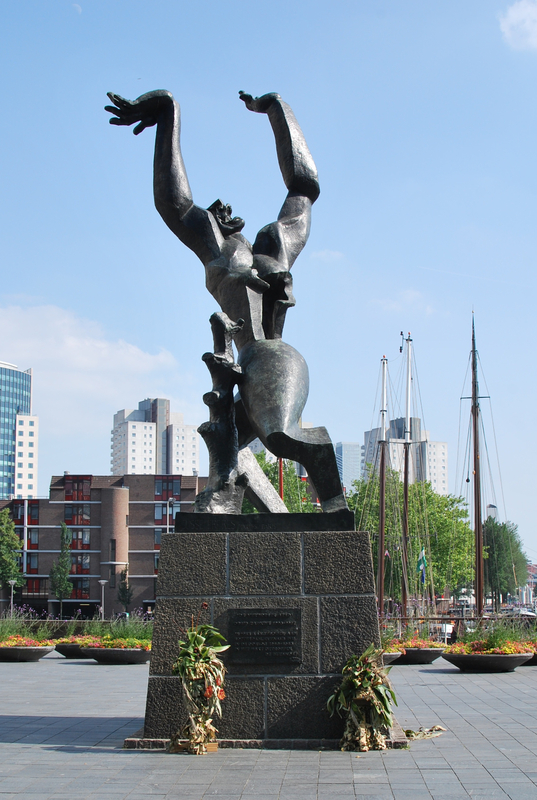 The Luftwaffe bombardment of Rotterdam on May 14, 1940 has long defined the contemporary city. That afternoon, in the space of ten minutes, old Rotterdam was devastated in a raid that killed 850 people and destroyed 25,000 homes and 11,000 other buildings. Many of these buildings had escaped a direct hit, but were lost to the uncontrollable fires that incinerated an area of about 258 hectares (a smidgen under one square mile). 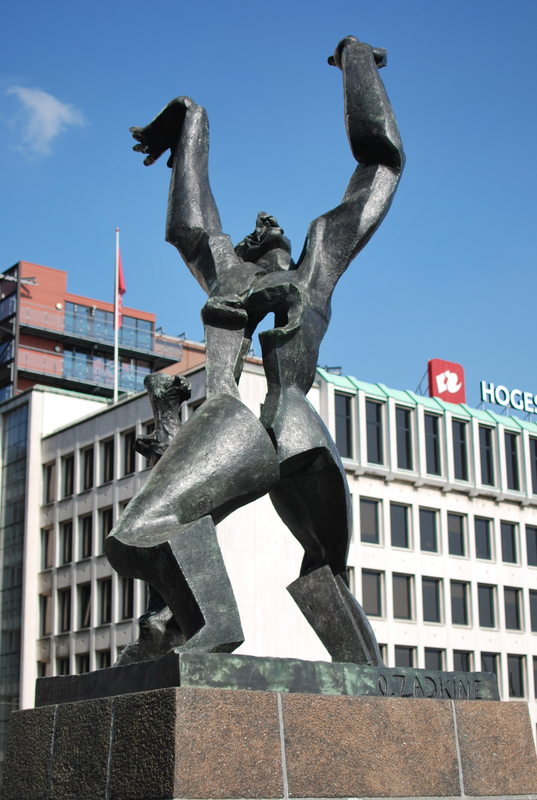 In 1946, the artist Ossip Zadkine travelled through Rotterdam by train and saw the empty heart of the city, cleared of rubble, stretching down to the river with only a few buildings still standing. The sight made a deep impression on him and provided the inspiration for De Verwoeste Stad (The Destroyed City). A small bronze of the sculpture was shown at the Stedelijk in Amsterdam in 1948, and in the winter of 1949-50, the statue was included in a retrospective of Zadkine’s work at the Museum Boijmans van Beuningen in Rotterdam. Zadkine had hoped for a commission and it came in the form of an anonymous offer to pay for a bronze cast of the statue. The design for the statue was not universally admired at the time. It was not an idealized figure or hero; it looked nothing like anyone’s expectation of a war memorial and the choice was much debated before the commission was paid by the anonymous patron in 1951. The identity of the patron was not publicly acknowledged until 25 years later when De Bijenkorf department store confirmed that it had been the driving force behind the commission. May 15, 2013 marked the 60th anniversary of the dedication of the statue. It stands on Plein 1940, the large open square between the Maritime Museum and a highrise apartment building at the Leuvehaven museum harbour. The statue stands six and half meters tall, installed on a tall granite plinth in the center of the square, and set back a way from the busy boulevard that runs past it. Behind it, the old ships moored in the museum harbour. There’s usually a sense of stillness around the statue despite the stream of vehicles on the boulevard and the foot traffic across the square. John Berger wrote of his impressions when he saw it in 1959. What is the meaning of this image? Or, rather what are the meanings? […] The figure represents the city. And the first dominant theme is that of the city being ravaged, razed. The hands and the head cry out against the sky from which the man-aimed bombs fall. […] The torso of the man is ripped open and his heart is destroyed. […] The legs give at the knees. The whole figure is about to fall. There is a short video of the unveiling of the statue on the Open Images website, an initiative of the Netherlands Institute for Sound and Vision. The narration is in Dutch only, but the video is only a little over a minute long and it gives an idea of what the area around the statue looked like in 1953. I am indebted to Joan Pachner for the story of the early years of De Verwoeste Stad. Source: Joan Pachner, Zadkine and Gabo in Rotterdam, Art Journal, Vol. 53, No. 4, Sculpture in Postwar Europe and America, 1945-59 (Winter, 1994), pp. 79-85.
at home and was accidently broken in 2012. I am wanting to buy a replica, can anyone help me find one. up mum’s belongings it is quite a sentimental item to me. Regards MB.